Proudly Announcing the 2018 Closing Session Speaker! Nick Bayer is a local CEO who really does it all. 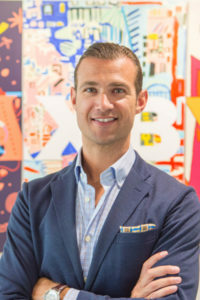 Since starting Saxbys in 2005, he has been named one of Philadelphia Business Journal’s Most Admired CEOs, enrolled as an ‘Entrepreneur in Residence’ at Cornell University, became a faculty member at Drexel University, and frequently guest lectures at the Wharton School of Business at the University of Pennsylvania, Temple University’s Fox School of Business, and Penn State’s Smeal College of Business; all while growing Saxbys at a rate of 30% per year. Culture is dynamic – not only does culture define the type of talent you bring onto your team, but culture is also a living, breathing, evolving component. The people you decide to bring into your company are the people you’re comfortable with (1) representing your culture today and (2) influencing the ways in which the culture evolves in its future. You are not only hiring for fit with culture, but making a bet that this is an individual who can advance, and elevate the culture for your company’s future. These ideas certainly apply to Saxbys and their Experiential Learning Program. They didn’t just invent ELP because it seemed like a lucrative idea to embark on. In fact, ELP was an organic outcome of their history, culture, their community, and their people and for that reason Saxbys was best positioned to lead this innovation. This is strategy, culture, and people all working symbiotically to provide Saxbys with a true competitive advantage. Everyone hired at Saxbys has an invested interest in doing more than just their basic job description: we want to get involved in other departments; we want to work outside the 9-5 hours; we want to get involved in the community; we want to not just write checks, but partner with organizations; we care about creating a social impact just as much as making money; we know creating opportunity through education is the key to future business leaders, etc. They would not have a great culture if their team did not care about their goals as a company. What you can do to create, build and grow a culture that cares. During this closing session, Nick will highlight the unique company culture of Saxbys, including how this daily focus on culture at all levels nurtures the entrepreneurial spirit in team members who aspire to be change makers and high performers. Nick will explain how a healthy and positive workplace corporate culture fosters engaged and motivated employees who are committed to the success of the company and the community; and how you can apply the lessons he has learned to strengthening your own team. Not only will you hear about the core values of Saxbys and how they drive the success of the business, you will gain a better understanding of how and why leaders need to stay true to core ideals, even as companies expand and become more successful.